Marissa began dancing at the age of four, with Just for Kicks Dance Studio’s first ever creative dance class. Her love of dance was nurtured as the studio grew. After graduating she moved to Vancouver and continued her training through the Arts Umbrella Professional Dance Program. Here, she had the opportunity to work with world renowned teachers and choreographers. 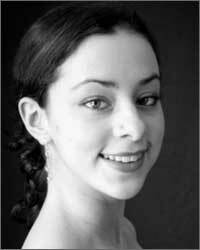 Marissa toured and performed in Japan with the Arts Umbrella Dance Company in 2005. As a professional dancer, she has performed with Joe Ink ( Vancouver), toured across Canada with Mascall Dance and presented her own work at the In House Festival (Vancouver). She has worked with PI Theatre Dance ( Montreal ) and represented Canada at the closing ceremonies of the Torino Winter Olympics in 2006. Four years later she performed at the 2010 Vancouver Winter Olympics, under the direction of Alberta Ballet Director Jean Grande Maitre. Marissa began studying yoga in 2007, receiving her certification through Ashtanga Yoga Montreal. She has instructed yoga for kids, teens, and adults in Montreal, Vancouver, Indonesia, and finally here in Salmon Arm.